The intersection of tech and philanthropy is a hot space right now. Over the last decade, digital fundraising has transformed the nonprofit world. The majority of donations to charities are made online, and Millennials are now thought to be the most generous generation ever, with more than 80 percent of the demographic giving to charity last year. While Millennials as a group don’t (yet) have a lot of money to give, they’re clearly motivated –– and discerning. So it’s natural that entrepreneurs are racing to create platforms that capitalize on our desire to give back –– with integrity and ease. Chicago startup YourBit is the newest player on the scene. The mobile app, which is still in development but slated to launch mid-January 2019, helps users support their favorite causes –– you guessed it, a little bit at a time. Download, sign up, and YourBit tracks, then rounds up your credit and debit card purchases, forwarding the “spare change” from each transaction to the organization you choose from its curated list of both local and national nonprofits. “Think Acorns for charity,” says Matt Minor, YourBit’s founder and CEO. 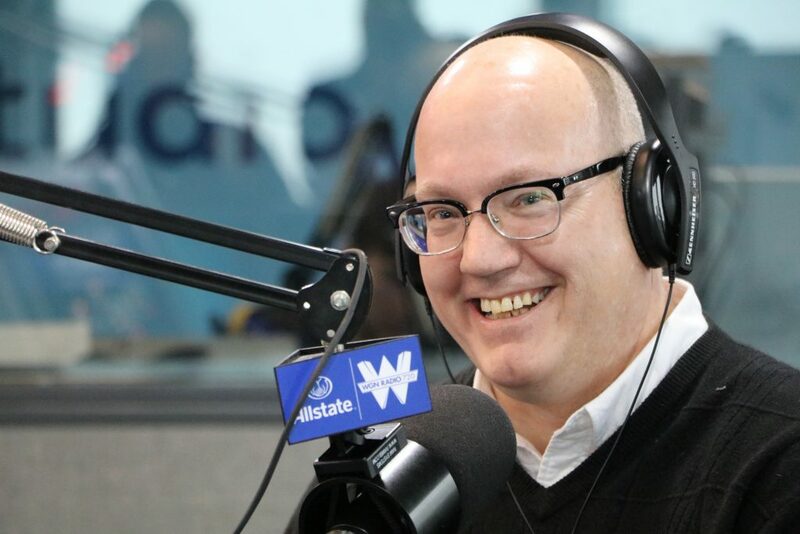 YourBit CEO Matthew Minor (above) talks to Scott during a recording of the Technori podcast in the WGN Radio studios. Matt comes to the charitable-for-profit scene as an attorney-executive with a background in legal tech, machine learning, artificial intelligence, and corporate law. I asked Matt what drew him to the charity market. “I was discussing next moves with one of my former partners. Half jokingly, he said, ‘have you thought about nonprofits?’ And I said, ‘well, we’re a nonprofit right now, but not on purpose’,” he laughs. Matt’s curiosity was piqued, though. He investigated the space and saw some clear advantages as well as market opportunities. “As I found out more about fundraising, I learned that Chicago is a terrific location to start any sort of charity because of the resources we have locally,” he says, noting that both CharityWatch and Giving USA are headquartered here in the Windy City. Matt also realized something that might seem counterintuitive at first, but makes total sense once he explains it. A fundraising platform that is actually a for-profit business can help nonprofits hold on to more of the money that’s raised on that platform. “A lot of charities are taken advantage of by fundraisers,” he says, observing that low efficiency rates can lead to charities keeping less than half of what development professionals, events or other high-overhead initiatives might bring in. How will YourBit get enough volume to make this fee structure work? By microtargeting, accomplished through geofencing. Instead, the app will feature the top 30 nationwide, “A”-rated organizations, but it will also highlight (based on the users’ location) a curated selection of reputable local nonprofits. Matt explains their rollout strategy: “We’re launching in 42 major metropolitan areas. Basically, if there’s a professional sports team, we’re going to support that area. It gets us about 82 percent coverage of national population,” he says. To onboard as many donors as possible, YourBit is building rich relationships with the charities it supports. “We want to not only bring them new donors, but we want to be able to leverage their donor base to make it easier for existing donors to give, as well,” says Matt. To help facilitate an ongoing relationship between users and causes, the app will feature rich content from charities so that donors can see how their gifts make an impact.